What’s more fun that spray painting a storm drain? Spray painting about 200 storm drains! 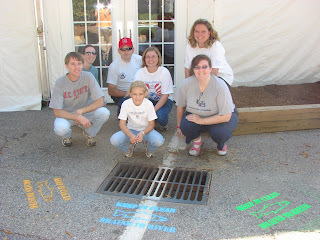 Thanks to a few tireless community volunteers, educational outreach folks from the Division of Water Quality, a little ‘ole me, Green Thing (I’m the one taking the picture), the State Fair is now “tagged” with a very important message – don’t toss litter down a storm drain because it pollutes our rivers and streams! In fact, stormwater runoff is the number one cause of water pollution in North Carolina and the nation, according to the N.C. Dept. of Environment and Natural Resources. We met this morning at the crack of 9 a.m., distributed brooms, paint and stencils, picked a brave soul to do the first drain (in an out-of-sight location…just in case) then we were off! After three hours of searching for storm drains (“OOH! There’s one!”) our message can now be seen all over the fairgrounds. So, when you visit the fair this year, see how many of these you can find. 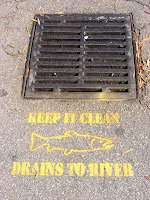 Division of Water Quality, Green NC, litter, storm drain stenciling. Bookmark. Looks like you guys did a great job with the stenciling project — and had a fun time while you were at it! Way to go Green Thing! Cute post! !